Romain Grosjean knew what he had to so in order to take the GP2 Asia Series points lead before Sunday's 2011 season finale race. The Swiss driver who had hoped to land a Formula One ride this year is now within closing distance to earn his sixth open-wheel title. The 2010 AutoGP champion already nailed down a GP2 Asia title in 2008. 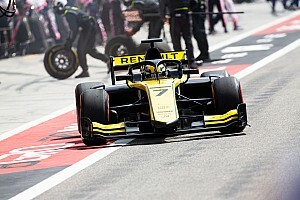 The series is racing at Imola, Italy instead of in Bahrain after the unrest cancelled both the second and third rounds. 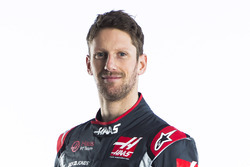 However for Grosjean, even if only four races would be complete, a championship is still a championship. 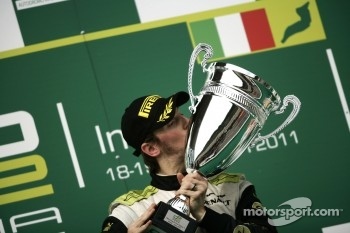 "It’s my first win in GP2 since Monaco 2009," said Grosjean. "It’s a long way. I am very pleased for the team. We did a great job from the free practice to qualifying and then to the race. We knew we had the pace. We are still working on the start. There are some things that we cannot manage ourselves. I tried to do my best and the story was quite a good one. 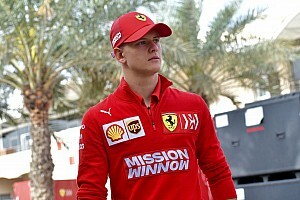 We will analyse why it was good today and not good in Abu Dhabi. And then it was just a perfect race." The DAMS team driver held the pole and took the lights to flag victory by 14.3 seconds over Giedo van der Garde who had a brilliant start. "We will make everything to get the title. At the beginning of the season, we were seeing the Asia Series like a test before the main Series. But when you are fighting at the front with drivers like Jules and Giedo you want to win. So, it’s a perfect weekend for now. We will try our best to do well tomorrow and see if we can drink some champagne tomorrow evening," added Grosjean. Van der Garde gave it a good fight with a start that saw him go from fifth on the grid to second in his Barwa Addax car. He surprised the one person who needed to get by Grosjean and hold on to his points lead but Jules Bianchi was stuck in third. Michael Herck and Sam Bird were also overtaken by van der Grarde. "I have to say that this season so far, I’ve had good starts. I think the team has managed to find a good solution for that. And we prove it again today from P5 to P2. It was good. I think we had the same pace as Romain at the beginning. After that I started to struggle with the rear tyres," said van der Garde. After the mandatory tire change, van der Garde gave chase again for the win but said, "Romain was a bit faster. I started to attack and the pace was not too bad, but as you saw with Jules you go slow and then you go quick. We tried to be constant and I think in the end we are in a good place. We still have to improve the car. But this result today is definitely a good boost for the team and for me." 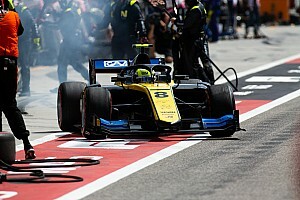 When Bird tried to make up ground, he and his iSport team mate Marcus Ericsson collided sending Bird into an early retirement. That left Lotus ART team's Bianchi with a bit of clear ground as he set off to take over second but in the end van der Garde held onto his position to place third. Bianchi explained his start: "I had too much wheel-spin again. So I don’t know... We have to look at the data to see what’s going wrong. Maybe I release the clutch too early and I cannot control the wheel-spin. It’s difficult to have a good start like that." Now second in the points, Bianchi simply said, "I had too much wheel-spin again. So I don’t know... We have to look at the data to see what’s going wrong. Maybe I release the clutch too early and I cannot control the wheel-spin. It’s difficult to have a good start like that." Scuderia Coloni's Herck finished fourth followed by Stefano Coletti for Trident Racing. Sixth went to Team Air Asia's Davide Valsecchi with Rapax's Fabio Leimer which left Racing Engineering's Dani Clos on the sprint race pole with his eighth place finish. Late word from GP2 stated that Valsecchi was excluded which moves him down the grid. That now moves Fairuz Fauzy for Super Nova Racing onto the pole. 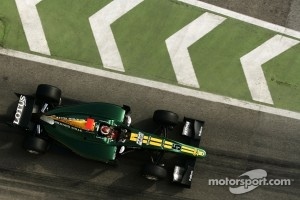 Stay tune for Sunday's sprint race which will determine the 2011 GP2 Asia Series champion.